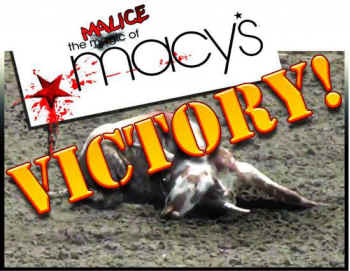 Last summer, SHARK launched a campaign to stop Macy's from sponsoring the cruel California Rodeo Salinas. Today we are pleased to announce that Macy's is not listed as a sponsor for the 2014 rodeo! Thanks to all of you who reached out to Macy's! It is dedicated activists like yourselves that make these campaigns successful for the animals.